A sudden spurt of speed, and a Tic, Tic, Tic of battered moped engine see’s a rider pull up to the stall without turning the engine off. His passenger steps off, and passes a dirty brown sack to the man in the stall, the delivery itself is twitching as the stall owner hands money to the riders, before disappearing back into the shadows of his shop with the cloth bag. The moped speeds away, smiles on the riders faces. 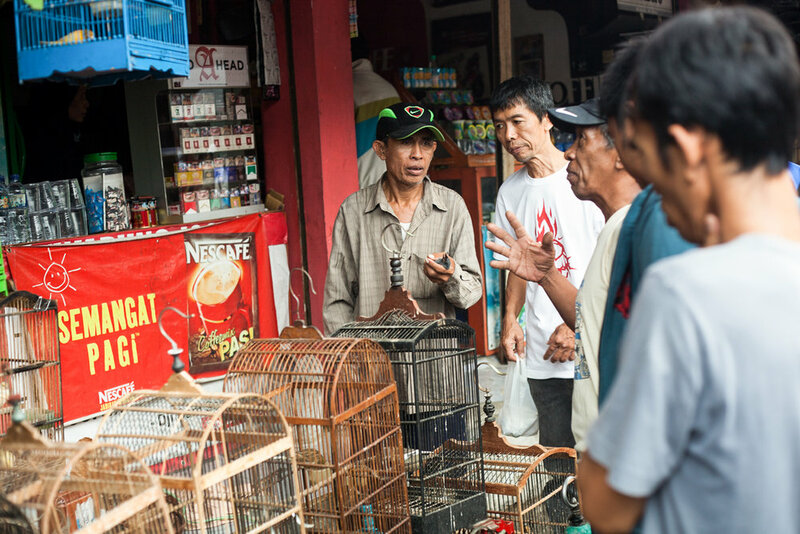 We are in Yogyakarta Bird Market. A collection of basic stalls and passageways, home to crate after crate of wildlife. The air is humid and sickly sweet, a pungent smell of rotting fruit and animal droppings lingers around every corner with no breeze to shake it. Walking the passage ways and trying to comprehend the sights is tough to stomach, especially compared to western pet shops. There are familiar animals for sale, cats, dogs and rabbits. All caged with little water and no food that we can see. The longer you look the more exotic the wildlife becomes. Large macaques sit caged next to iguanas and geckos. There is a feeling of dread for the varied inhabitants of the rusted cages. An animals modern day Auschwitz. For anyone with a mind for animal rights, it is a distressing sight. 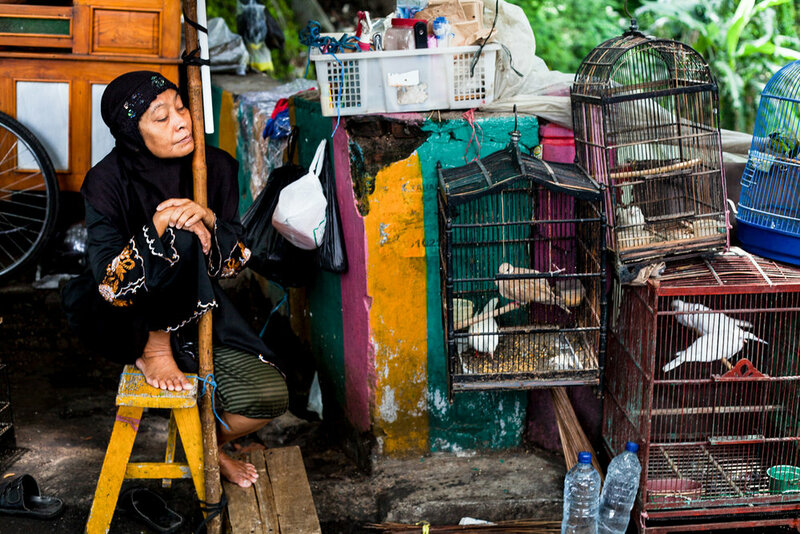 Nocturnal animals such as Bats and Civets lay baking in the sun as we see a cage of owls, one with a broken wing, laying next to two dead chicks. The scenes are depressing and tough to view. We see a full flock of white headed Munia, small wetland finches, crammed into a cage only a few feet across. We have strong urge to try and buy some of the animals to set them free. However in doing so, it would give the stall owners more incentive to track down other animals and the cycle would repeat itself. 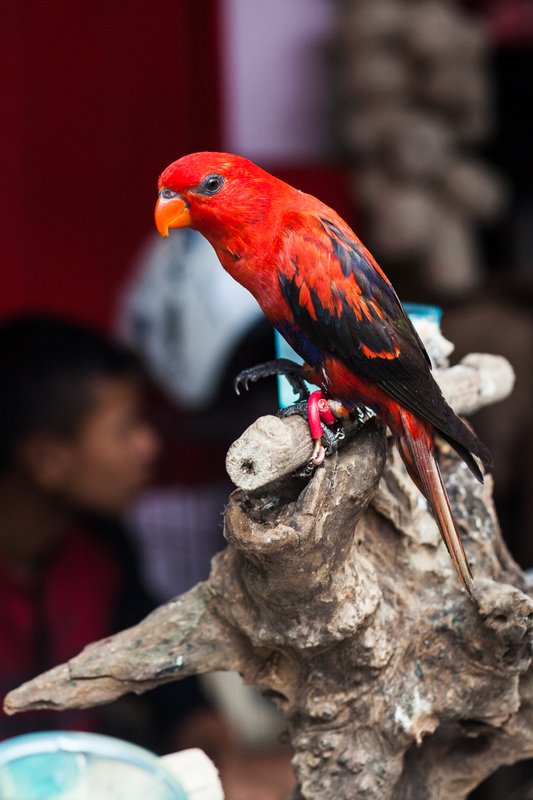 In Malange we see a similar market, with monkeys, owls and kingfishers on display. 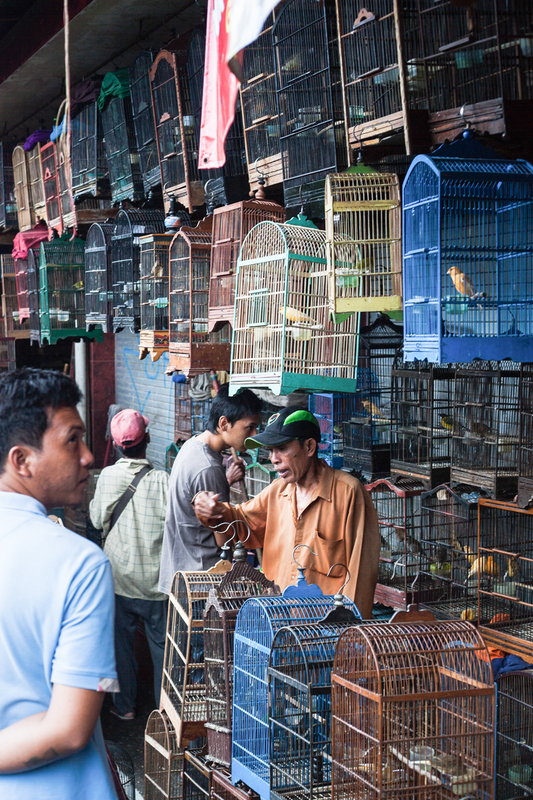 There are ornate cages to buy, as many Indonesians believe the birds bring a shop good luck and are a sign of wealth, particularly the stunning birds of paradise. 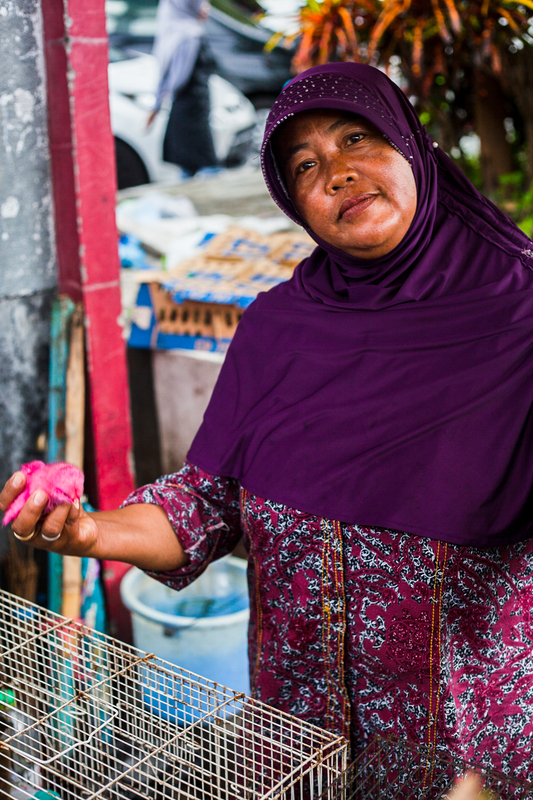 Malagne market is similar to Yogyakarta, however there is a lot more respect for the livestock. The animals are fed and watered and stalls offer seeds and insects for pet food. It is just as distressing to see some of the animals in a bad state, but the place feels different. I speak to a man calling himself Kevin, who showed me his collection of pigeons. He tells me he likes them very much and takes good care of them. I glance at the birds, they are far from pristine, but they are very much alive and without injury. Further along the market a man selling puppies agrees to have his photo taken. He smiles and points to the small dogs proudly. A group of teenagers open a cage for us, and pull out a Sugar Glider out for us to hold. They laugh but seem to have a fondness for the tiny marsupial. 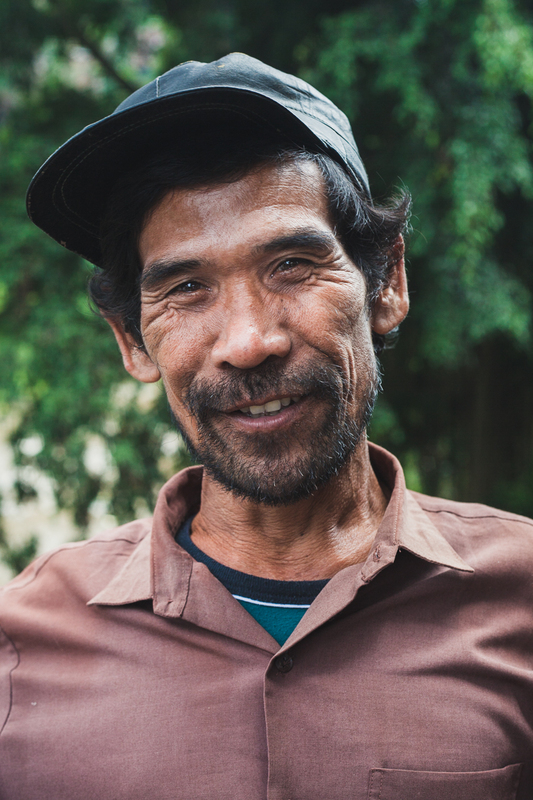 Indonesia is a place of breath taking natural beauty, with a human population as varied and incredible as its wildlife. It is heart wrenching to see the extent of harm that is bought upon many of the animals in close contact with humans, not to mention the issues facing the Orangutans of Borneo and Sumatra. Despite this, I feel there is a certain amount of hope that could be taken from some of the market workers of Malange. The people seemed to have a love for the animals, but not the knowledge to provide the correct care. Something I hope can be provided to the country in some form or another. As for the darker side of the animal trade, I hope that it can be stopped as quickly as possible.